Opakapaka Grill and Bar, located on the picturesque North Shore of Kaua’i, gives you breathtaking oceanfront views with amazing dining and cocktail offerings. We are open daily for lunch, happy hour and dinner, and serve only the freshest seafood, steaks, and farm-to-table produce you can find. We pride ourselves on sourcing local products that support the local community – from the fishermen and ranchers who provide our proteins, to farmers who give us amazing fresh fruit and vegetables and artisans whose work adorns our restaurant. You can find us on the grounds of the Hanalei Colony Resort. After reading either rave reviews or terrible reviews I decided to give this place pa try. And it was one of the few places that had an open reservation for 6 on such short notice. We arrived about 15 minutes early and they were able to accommodate us relatively quickly. The menu was disappointingly small and not farm-to-table as I had read somewhere. The food came out quickly and the fish seemed fish. We had the poke salad, 2 mixed plates, the fish of the day (Ahi, grilled) and a kids chicken finger plate and a kids buttered noodles. The fish of the day seemed fresh and was tenderly cooked. My poke bowl was average but was generous with the ahi. The mixed plate was a bit disappointing. The fried fish was so thick and hearty that we thought it was chicken. The Kalalau pork was a huge letdown, dry, stringy and too sweet. All the steamed veggies were slightly mushy and bland. Kids noodles & chicken was ok. The ratio of batter to chicken was like 90:10! But my kid liked it so I won’t complain. We had two cocktails that were strong and good, yet pricey. The restaurant decor is kind of sad and outdated. Location wise and view (unfortunately we dined after sunset so we couldn’t see the ocean but we could hear it) give this place potential. The menu is too small to have something for everyone, I think. If you’re in the area, give this place a try but not worth the drive if you aren’t. Wonderful view/location. Cocktails were perfect and food was excellent. Kelsey (our server) was attentive and fun. 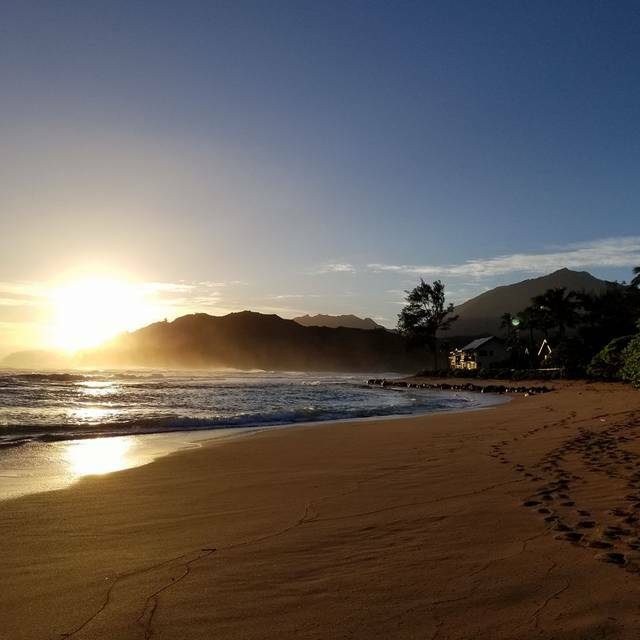 The view is worth the visit at this restaurant, and there are not many choices in this part of Kauai after you get west of Hanelei. We had an enjoyable dinner. Our waitress was delightful, but there didn't seem to be enough staff to keep things moving along. The food was reasonably good but by no means outstanding. We had a pretty loud party next to us who seemed to be enjoying their drinks. All in all, we had a nice dinner and I would go back again if in that remote part of the world. Excellent fresh fish, perfectly grilled! Service very good and seating accommodated my husband's disability. Very kind and attentive! The server was good. However, the food was old and not good at all. The dish that I got was 40$ and honestly if i had known, i wouldn’t even pay $5 for it! This placy is very pricy and doesn’t deserve it at all!!!! Pulled pork was dry, fish (ono) was dry with no flavor, breaded chicken deep fried was tasteless. Lengthy wait for food. May try one more time but this meal is not a good sign for a new restaurant trying to establish a reputation. Menu nothing like what is on their web site. After the hostess showed us to our table, it was 20 minutes until a server appeared! We had a great meal! Cocktails were unique and tasty! Please include Opakapaka to your Kauai vacation, as we did. Our family of six had a great time and only a short, beautiful drive from Hanalei! They are absolutely family friendly. Worst meal I have ever had. Took 1 hour to get our appetizer. Asked for bread and that took forever. They had one salt/pepper grinder that the waitresses ran from one table to the next. My wife had a local catch opaka that was very small but cost $36. They were understaffed and had just one cook. They sat us at a table with a window wide open . They tried to close it but it didn’t close. We sat at 3 different tables before the night was through. Don’t go here- it is a rip-off. Everything we ordered was over salted and over cooked (and some dishes were even burnt). The windows wouldn’t close and there were flies everywhere. Other than prime location and a wonderful server, there wasn’t much to brag about. Would not recommend. Limited menu prepared well. Good service and great views. Great food in great location. One of few restaurants that is actually on the beach. Very good service with nice staff. Great location by the ocean. We went for the view and the food was good. Our server wasn’t on top of her game. She admitted to that and gave us a 15% discount towards our food. The food was good and the view was awesome. Great Server, food was good, interesting drive to get there. Overall I would say worth the trip! We arrived a few minutes early for our reservation and were promptly seated. Our server, Ashley, was very attentive and helpful. Our food arrived in an appropriate amount of time and was very tasty. 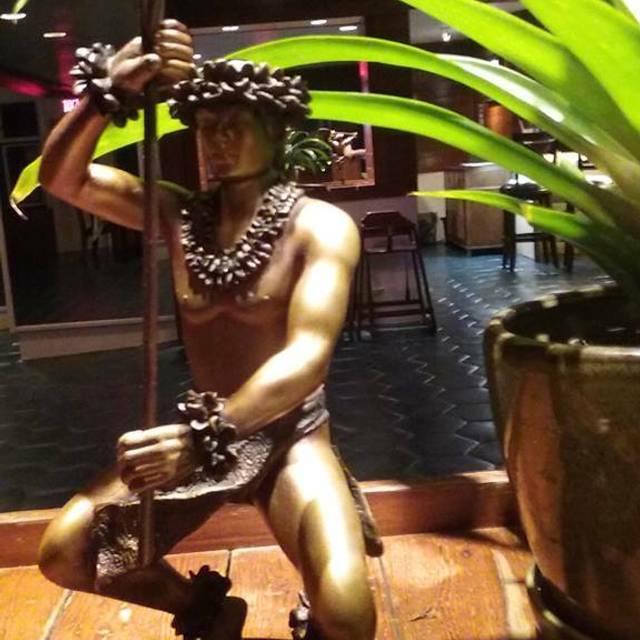 Overall, we'd tell anyone looking for a good Kaua'i restaurant to head to OGB. Remember, this is Hawai'i, so prices and pace are not the same as on the mainland. Relax and enjoy yourself. We had spinach dip, which we appreciated was actually heavy on the spinach and light on the Mayo. The rib eye pupu steak was excellent and our two boys split that instead of getting kid's meals. Our party also had two burgers and two mixed plates, which were flavorful and presented well. We asked our server if meat temperatures were pretty accurate and she let us know that they tend to run a little over, so if you want a medium rare burger, order it rare. Even still, the burgers were flavorful and juicy. Reservation made of a birthday request for a cake and candle, they confirmed and was forgotten when we were there. Pics on their advertising showed table cloths, yet none of the tables had any. Tables too high for pleasant dining. Poor lighting added to lack of ambiance. Was told on the phone that corkage fee was $15 but when we were seated, waitress insisted that the fee was $25. Mgr. finally kindly waived the fee. Food was overall good, but not a place to dine with any atmosphere. Way too overpriced of an establishment to be using paper napkins. The special, Ahi Tuna was dry and bland. Would not return here. Walked out. Don’t waste your time. I have never written a negative review on Open Table before, so this is a big move. The menu on Open Table is COMPLETELY different and the real menu was not worth the drive. We arrived on time, but had to wait 10 minutes to be seated in a relatively empty restaurant. NO ONE approached us for more than 20 minutes after seating- oh did I mention that the restaurant was not nearly full? The young man pouring water was the only one who stopped by the table. Two people did approach us as we left and we told them the same thing. UNACCEPTABLE. This restaurant was amazing. Our server, Misha, was one of the best servers that we have ever had. The food was also to die for! 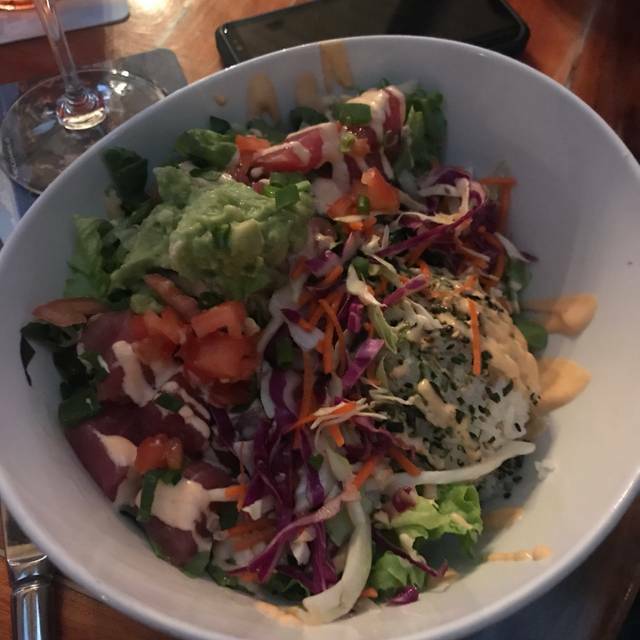 We took all of the recommendations of our server and ordered the poke bowl which was amazing and we also ordered the chicken wings as an appetizer, The ahi tuna seared, the Pu Pu steak, the pasta Primavera. All dishes were amazing! 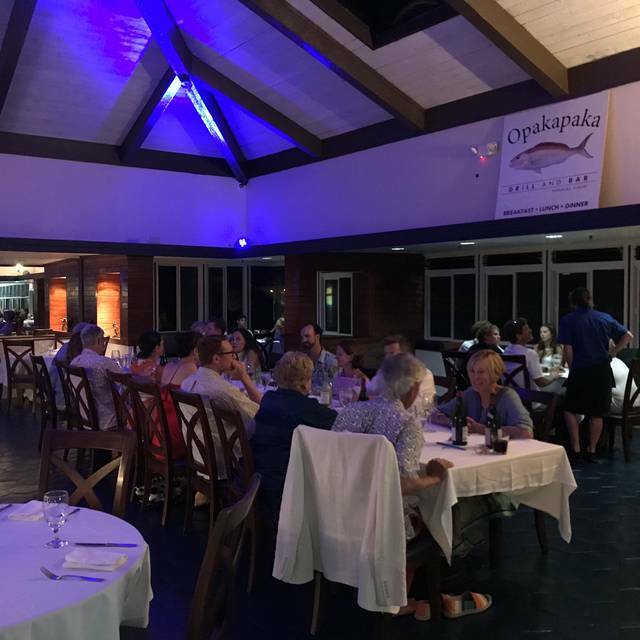 Seaside dining, great food, great service! Couldn't ask for better experience! Went for our honeymoon. Loved it! People were so friendly and the food was very delicious! Very nice view, seafood chowder was good. Would come again. The service was so slow we didn’t even stay for the meal. It seemed to be a nice place though! Great, secluded location (probably works against it though....unless you’re-up for a 5 mike winding road in the dark). Servers were very nice, the kid with the water was the most attentive! Food was not remarkable, but came with great efficiency. Kinda a quirky place/odd-layout. They need to add the finishing touches to the presentation. We had a reservation for 8 and arrived 7 mins early. They weren’t ready and sat us 10 mins late even though half the restaurant was empty. We waited 20 mins to receive drinks, 40 for appetizers and 1hr 20 mins for our entrees. One person ordered a medium rare burger and received a burger very well done. Then we waited another 15 mins for a replacement burger which was medium well, still not medium rare. The rice was old and had crispy bits in it. The only entree that was good was the ahi tuna, but that entree was waived anyway because it came out 15 mins after the other entrees. The service took so long we almost left, but we had waited so long we decided to stick it out. Major bummer of a night. The only positive was their Greek salad. Christmas Dinner. Reservation 7:15. Hostess welcomed us warmly and brought us to our table. Waiter came and said only available fish for the night was tuna. Also others entrees were not available anymore. Ordered tuna since was only seafood option. Up on ordering waiter came back and said that the fish was not available anymore for the night. We left since no other options were available for us to have dinner. Disappointing experience expecially after a 30 minutes drive to get to the restaurant. What absolute nonsense. We had a 7:15 Christmas reservation and upon arrival we were sat and then told they there was not a single piece of fish in house. At 7:15. In Hawaii. The menu was already reduced and no one bothered to alert me and my reservation to that fact. That alone would be unforgivable on the mainland. Our waitress seemed unbothered by the fact that every. Single. Entree was sold out. Including the burger. I am vegetarian and my only option was a salad or to pay $45 for a pasta on a buffet line. $45 for buffet pasta. That's ridiculous. They clearly are unfit to run a restaurant and have sufficiently ruined our Christmas dinner. Absolutely unacceptable. Also, very loud as all surfaces are hard. A horrific experience. Had a reservation for Christmas dinner. We arrive, order, and then are told after 20 minutes that they’re out of what we ordered. And out of literally everything else on the menu, too. No offer of compensation, nothing. A restaurant without food. What’s the point? A nightmare experience. Please do not waste your time to suffer the same indignity that we did on what was supposed to be a joyous holiday occasion. This restaurant literally ruined Christmas for us. Unforgivable. Still waiting for an apology from the owner. So far, nothing. Please do not make the same mistake that we did. Stay way! It’s a total sh*t show at Opakapaka. Staff and service was top notch. Views are unparalleled. North Shore Kauai oceanfront dining! Open 11am-10pm 7 days a week! Fresh local fish, steak, they have it all! 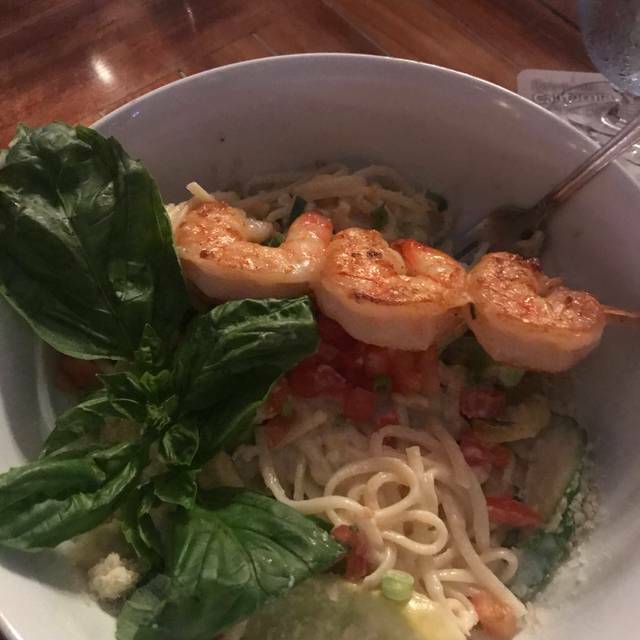 My husband and I were vacationing on the north shore and decided to try this restaurant because it was on the water, and the menu looked interesting. 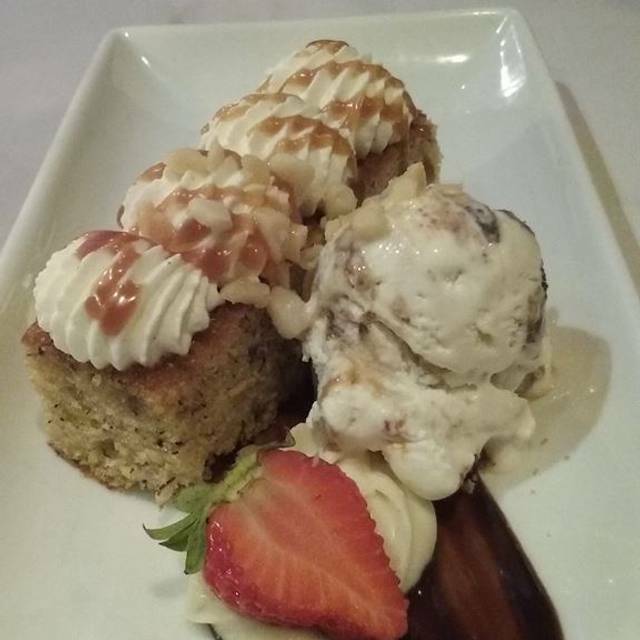 When we arrived, we were initially disappointed because the menu was very different from the one posted online but decided to stay. We were surprisingly impressed with our entrees. The food was very fresh and the flavors complimentary. We enjoyed it so much, we went back a second time for lunch. (Also excellent). Great service. Still no be vegetarian dish. Do something about the noise level. Add 1 or 2 vegetarian dishes. Our server was great but had to manage too many tables, add staff. When in Kauai we always make it a destination for dinner. The Mai Tais were delicious. However the seafood chowder was way too salty and the service was painfully slow.